There is a larger than usual list of links this week, we’ve got everything from lawn mowers and Lithuanian comic books to Homer cakes and another rebuttal of the idea that pop culture necessarily ages badly. As for the title, well, there are two of them. First someone pines for a crossover, and then an art teacher talks about how the interests of kids have changed over time. Then someone gets a crossover, and we discover a way to infiltrate the very young. Plus there’s the usual assortment of excellent usage, lists, and people who agree with us. If your box says “Wrap your hair SPA STYLE with the cool hair wrap”, maybe it’s time to stop marketing your product as educational. A quotable cake. – A delectable looking Homer cake, complete with lots of quotes and photos. Homer Simpson’s Duff beer gives Lithuanian publisher a headache – I don’t know much about Lithuania, but this seems pretty dumb. Lithuania has rules against advertising alcohol in comics. Some genius, or shakedown artist take your pick, decided that even though Duff is fictional, because there are bootleg versions of it available in places like Mexico and Spain that depicting it requires a shutdown in publishing and a nearly $4,000 fine (via). Yes, I was told it has existed for more than twenty years, and they have been moving and speaking for more than 20 years. But I didn’t know. I watched a DVD of two or three excerpts from the last few episodes. 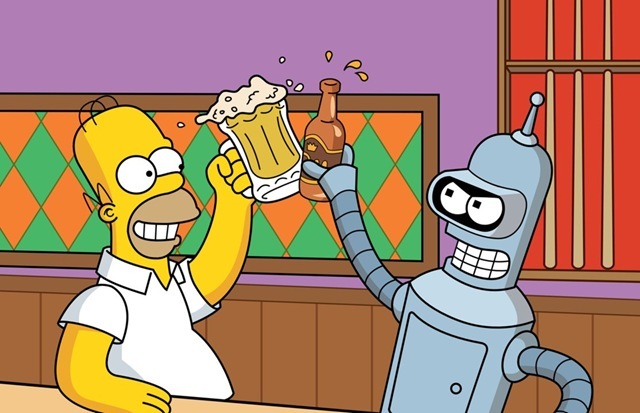 Yep, that’s right; the man whose legendary alcohol consumption allegedly inspired The Simpsons’ beer-mascot Duff Man now wants his peers to trust him with their royalties. I, uh, never heard that Duff beer was based on him. Nor do I think it was. Simpsons fan turns living room into model of cartoon town Springfield – A Daily Mail story (with lots of pictures) about Forty Square Feet of Awesome (via @springfieldx2). Nazi zombie simpsons – This is just a video of a Call of Duty mod someone made of the Simpsons house where the bad guys are zombies dressed like Homer. You can watch 15 seconds of it and get the flavor, but there’s no way I’m not linking something called “Nazi zombie simpsons”. Anyone who disputes the brilliance of The Simpsons needs to be hit over the head with this season. You Are Lisa Simpson – That remains one of the most bittersweet moments in the entire show. Also this is a blog titled “What I’m With Isn’t It. . .”. Nice. Weed…In 10 Words – The hover text is from the only decent segment (notice I did not say “episode”) in Season 13. On pop culture references – That Matt Zoller Seitz article about the longevity of pop culture continues to echo through the internet. This nice summation includes everything from Arrested Development to Jane Austen. quote of the day. 04/17/11 – The quote is missing a “just” between “you” and “go”, but that’s nitpicking, not the American way. Mr. Harper for PM, I mean, Mr. Burns. – Excellent Hulu YouTube of the Burns for Governor campaign team. This month’s article begins with Bart Simpson lamenting “you’re damned if you do and you’re damned if you don’t”. How very true! Whenever I do this, I think of Homer Simpson at the end of “Dead Putting Society” (from Season Two, at least eight seasons before the show began to head downhill). He and Ned entered into a wager about the miniature golf competition their sons were in. Because the contract was poorly written, both fathers lost the bet and each had to mow the other’s lawn in his wife’s Sunday dress. 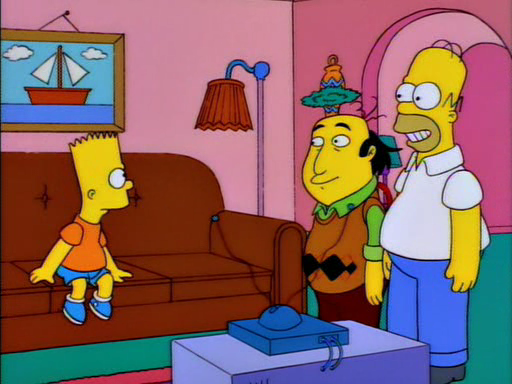 Homer’s mower is like ours and the animators have him push-push-pushing the mower when it gets caught up on the grass. I wasn’t wearing a churchy dress (I was wearing jeans and a nursing top with lace on it), but I always picture Homer when I’m mowing. I, too, have a push mower and, yes, it is impossible to use that thing without thinking of that episode. Simpsons Sign WIN – The political wisdom of Kang and Kodos will be with us always. Harry Plopper WIN – Someone gave the recently released Harry Potter DVDs a nice sign. America Fun Fact of the Day 4/18- Insane American Patents – Some old, enjoyably wackaloon patents that I hope never got made, with bonus reference to “Deep Space Homer”. “When will I learn? The answer to life’s problems aren’t at the bottom of a bottle, they’re on TV!” -Homer Simpson – God bless Season 1 quotes from Freakoutville. The conceit behind these stories is that Fry reads Simpsons comics and he can be sent into their fictional world (a great way to avoid any “timeline conflicts,” should anyone care about that sorta thing. In the first part, the brains that terrorize everyone in New New York (except Fry who is immune to their brain waves) make fictional characters come alive (much fun is had with that). And since Fry has a Simpsons comic, all of the Springfield residents come to New New York and mayhem ensues. "The social media world has been a huge boondoggle for bad guys, not just in digging up information about you, but also in the vector of attack," said Stuart McClure, general manager, SVP and CTO of the risk and compliance unit at McAfee. "Bart Simpson used to put 10 megaphones together and whisper so it became a huge cacophony of sound. Much the same thing is happening with social media." Back in the Day: meet the Simpsons – Nice picture of Groening and some people in costumes with the dead eyes. Layne said when he began teaching art all of his students wanted to do projects featuring Bart Simpson, and later they wanted to do Spongebob Squarepants. “Betty Boop has made a comeback, and this year it’s been Sesame Street,” he said. “I’ve got Cookie Monster and Oscar and several Elmos. Damn kids, not fawning over Bart like it’s 1990. If only there was a way to correct that . . .
Coloring Pages maggie simpson – . . . how about some printable coloring book images for toddlers? Get ’em young, I say. Handsome Pete – The Haiku. Homer – The Kindle screensaver. The Top 5 Simpsons Episodes – This list is from our friends over at Stay Tooned In. Good on them for having nothing past Season 7. It will be performed by Brady Bunch Singers and Gilligan’s Island Orchestra, with the organisers also promising special appearances from a number of secret guests. Joe Montegna Honoured With Walk Of Fame Star – Watch out, Laszlo Panaflex. Maggie Roswell is wanted dead or alive by folks on "Simpsons" – A rather fawning interview with Maggie Roswell in The Denver Post. Interesting tidbit, she rarely watches Zombie Simpsons. Ed Helms Totally Looks Like Frank Grimes – In that picture he does. Paper Pezzy- Ned Flanders by ~CyberDrone – Printable papercraft Ned Flanders. Teenage Maggie Simpson by ~Kenny-The-O – Fan made sketch of teenage Maggie from “Lisa’s Wedding”. Scorpio, Wherefore Art Thou? – Same site as the above, but of a more recent vintage. Well past its twentieth season, the once brilliant show has wrung itself painfully dry of laughs, and has only to be retired in physical fact as well as in attitude and spirit. Love the post! (And the site–will totally be checking out more). Click of the Week! Woo-hoo! Werner Herzog didn’t know The Simpsons was a show? I’m at a loss for words right now. Thanks for the quote, great page by the way!